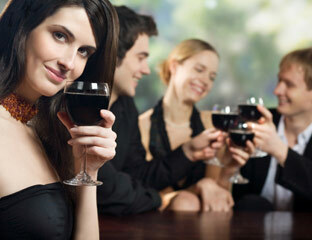 Have you ever known a person who becomes a “connoisseur” of wine? Often that person seems unhappy with most of the wine he or she drinks. The connoisseur has too often learned to be mostly unhappy. Isn’t that ironic? It’s the fluid your and your friends’ hearts pump. The path to becoming “one who knows” (from Old French: connoisseur) starts with drinking just any ol’ wine. Then slowly taste discrimination comes along. Later, the risk grows that fewer and fewer wines will be as satisfying as they once were. “The one who knows” perhaps may not know the most important thing about wine: It isn’t the red stuff in the glass; it’s the quality of people with whom you share wine that is important. It’s their lives, their flesh and blood in your life that matters most. Along the way, wine, or tango, or music sometimes no longer satisfies the “one who knows” who has become impersonal in their “knowing.” Unfortunately this pseudo-connoisseur has learned so much it has them standing alone with the thing they know. Perhaps the Spanish version of the Old French word, connoisseur, conocer, can give us some insight about the difference between the pseudo-connoisseur and the true connoisseur: Conocer is personal knowing. Saber is impersonal knowing. So the question, “Do you know [sabe] who that person is?” is answered with saber if you know who the person is. However if you know her personally, you use conocer: “Sí, la conozco.” [Yes, I know her personally.] If someone asks you, ¿Conoces Buenos Aires? The answer is “no” if you have never walked her streets or met her people. Knowing personally is the antidote against poisoning your wine, your tango or your music appreciation. I try to focus on the larger picture. A true connoisseur knows the larger meaning of sharing wine. It may be a profoundly religious moment. It may be a celebration of a new love or very old friendship. Isn’t it the same way with tango and other beautiful things in life? A step in the right direction is to be a true connoisseur of taste in three things around the thing you love: People, presentation and sustainability. In wine, it would be a good-tasting wine, shared with quality people, and the excellent presentation of the wine at your gathering. Finally, can this be sustained? Can you afford to do this again? In tango, it is tango-talent (as the thing “to know”), plus people with culture and depth whom you know. A milonga with great music, lighting and a decent floor is the presentation. Finally, can this be sustained? Did you ruin your feet or your pocketbook? I am not suggesting, ladies, that you drink cheap wine! I understand that you have the right to be picky. Save your feet. Avoid the guy who doesn’t bathe. Turn away your gaze from the tango tomcat. I understand why this must be done: Dancing with men who jerk you around, step on your feet, and make you and your clothes reek is not sustainable! If I hold a beginner or any person with reverence and I am open to being present, I “hear” the story of a human being in front of me and that somehow harmonizes with the music in a very special way. I believe that is what truly brings you back to tango over and over. Keep doing this. You will be blessed with many great tandas. Embracing the moment is tango. It’s life.